The guards suspected the animal might be involved in drug smuggling once they noticed four prisoners visibly intoxicated shortly after the pigeon landed on a prison window,” Zenica prison official Josip Pojavnik told AFP. All four inmates had tested positive for heroin, said Pojavnik, adding disciplinary proceedings had been launched against the inmates. The bird is refusing to talk. As a burglar, John Pearce thinks nothing of turning his victims’ homes upside down. But this time it was the house that turned him the wrong way up. Attempting a daylight raid, the 32-year-old somehow got his foot caught after smashing his way through the front window of a Victorian terrace home at 6pm. 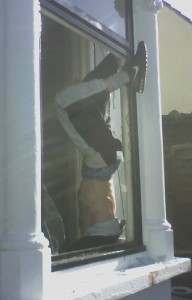 Unable to free himself, Pearce was left hanging upside down in the window frame for more than an hour as a crowd of 30 neighbours and passers-by gathered to ridicule him in Dartford, Kent.